Officially 100 years ago this month, Greyhound began its journey of growing into America’s dominant method of long-distance road travel. To celebrate, we caught up with the fine folks of Greyhound. They were gracious enough to share some amazing photos with us that beautifully illustrate their history and remind us of a time when "Scenicruiser" was a common word...and that the company used to own Dial soap (really!). On our end, we dug further, and found 16 things about Greyhound that you probably didn’t know. Enjoy the trip through memory lane. 1. Greyhound was originally a town-to-town transport service for miners in Minnesota. Its founder was a car salesman for Hupp Motors, where he’d take a Hupmobile and charge 15 cents for a ride from Hibbing to Alice, MN. 2. It was started by a Jerk. As in, Martis Jerk, originally of Sweden. He immigrated to America, at which point he changed his name to Carl Eric Wickman. 3. The company got its first actual buses in 1921. 4. It first unveiled the greyhound dog as the mascot in 1930. Also, it launched national radio advertisements at the same time. This was when the company really took off. 5. It operated its own restaurant chains. First Post House (located in hundreds of Greyhound stations, so you’d never have to leave the terminal), followed by Horne’s. Between the two, Greyhound served over 275 million meals per year at its peak. 6. The company was dedicated to pushing advanced technology. It was the first company to fully adopt rear-engined busses, like the ones seen today, rolling them out as early as 1936. 7. During WWII, nearly half of the Greyhound bus drivers were women. Just as Rosie the Riveter helped out in factories, Greyhound’s female drivers took soldiers across the country as needed. 8. This is what Greyhound told you Florida looked like in 1947. Apparently, girls used to love bus drivers. 9. When the Federal Interstate Highway System was established, GM designed a bus exclusively for Greyhound. Starting in 1954, the Scenicruiser became synonymous with long highway trips. The one here? It was the very first one. 10. Greyhound’s stations and buses were part of the same visual theme. A subset of Art Deco, Streamline Moderne was the epitome of style in the 1930s. 11. It employed Streamline Moderne design legend, Raymond Loewy, to design the buses. He also designed classics like the Studebaker Avanti and one of the most gorgeous trains ever built. 12. Bathrooms and extra luggage storage were abundant on board. Consider that one a minute: it developed a bus specifically so you could carry more luggage, and they didn’t upcharge you for it. Are you listening, every airline in America? 13. Until the mid 1980s, Greyhound owned Dial soap and Armour Hot Dogs. Seriously. Both of which are very welcome after a day-long bus ride. 14. 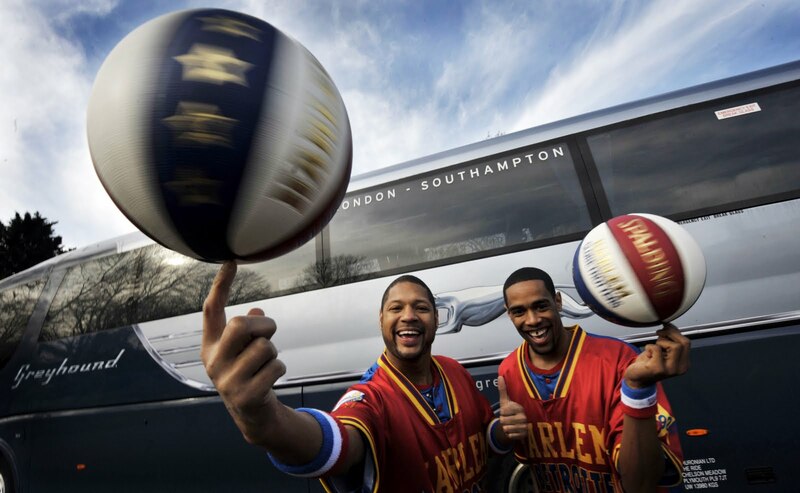 Greyhound is the official bus of the Harlem Globetrotters. Greyhound has, for decades, offered free rides to runaway children that want to return home. The number of free rides is now over 10,000. 16. Greyhound offers shipping with 24/7 delivery. Not kidding. It will pick up and drop off packages at your door at any hour of the day or night, including holidays. Mention that to your US Postal/UPS/FedEx employee the next time they’re on your porch, breaking your new vase. Aaron Miller is the Rides editor for Supercompressor. He’s never actually ridden on a Greyhound bus, but he kinda wants to go for a trip on an old Scenicruiser now.